The traveling classroom program of The Children’s Museum travels all across Connecticut, Massachusetts and New York, bringing science to schools, libraries, scout meetings and more. Looking to save on the cost, time and effort of making a trip to us? Having outreach come to you is the answer. With more than 20 programs for grades PK-8, our outreach covers a wide variety of topics that are sure to spark excitement for science. 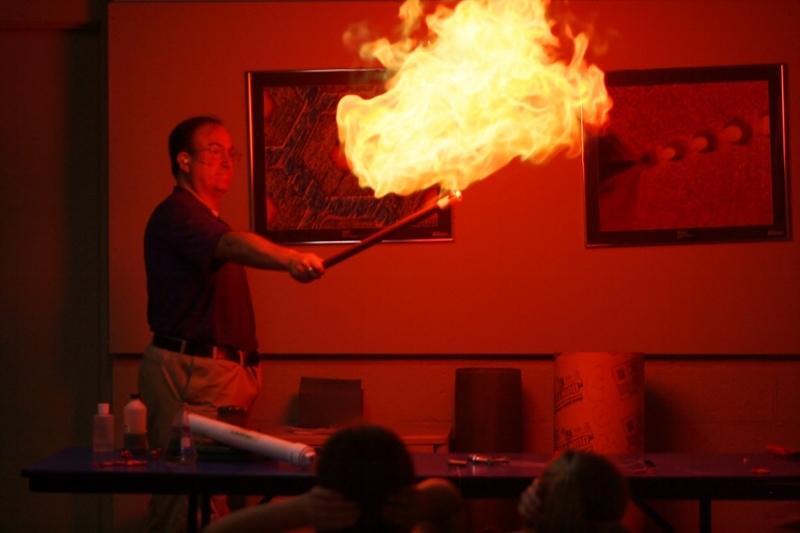 Our assembly programs can serve large audiences and are filled with spectacular demonstrations on chemistry, sound, electricity, flight and more. Live animals from the Museum’s Wildlife Sanctuary can hit the road to visit you. We bring the night sky indoors with the STARLAB portable planetarium. Hands-on classroom programs let smaller groups get up close and personal with engineering, slime, insects, forensics, music and other science subjects. In our science showcases, hands-on, museum style exhibits explore electricity, magnets, lights, motion and bubbles. Schedule a traveling classroom program today! For questions or to schedule a program, contact our Registration Department or call 860.726.4008. Study some of our Wildlife Sanctuary animals and determine the unique ways they have adapted to meet their specific needs. Compare similarities and differences between mammals, reptiles, amphibians and insects. Learn about amphibians’ unique life cycles. Compare and contrast frogs from around the world as you discover what makes them so unique. Learn about the unique life cycles of amphibians and insects and their amazing adaptations that help them to survive. Explore the reasons why some animals become extinct while other thrive. Get up close and personal with some native Connecticut animals and learn about the human activities that affect them. Some animals thrive in the humid rainforest, others in the dry desert. Examine the adaptations of these animals from such dramatically contrasting habitats. Meet a group of animals and discuss how they would fit together as a food web in their natural habitats. Investigate plants from the inside out by dissecting flowers. Learn about their lifecycles and why plants are so important to humans. Students will conduct slimy experiments to learn about solids, liquids and the strange chains called polymers. Students become super sleuths as they decode fingerprints and analyze ink composition. They will be challenged to solve a crime using their new skills. Student teams use critical thinking skills to invent a new machine. What will your students create? Examine different types of soil and find out how they are formed. Students will conduct hands-on experiments with dirt. Learn how igneous, sedimentary and metamorphic rocks form. Examine rocks and minerals for geologic clues. This microchemistry program challenges students to analyze variables and discover the causes of more than 25 surprising chemical experiments. Students will tinker with electricity and magnets in stations as well as see some electrifying demonstrations. Discover shapes and designs that have helped bridges bear heavy loads for centuries. Study how human activities affect our environment, including air, water, and land. Determine ways to reduce human impact on the environment. Learn how fossils tell us about life in the past, Compare modern and fossil forms (shark, squid, clam, brachiopod) to understand the similarities and differences over time as evolution shapes all life. Our Science Adventures allows you to choose three topics, each filled with spectacular and educational demonstrations. Choose three of the fun filled topics below. Don’t see exactly what you are looking for? Have a special topic or theme from class you’d like to build upon? Call us today and speak with one of our educators about what we can arrange especially for your students. The museum has numerous resources we can adapt for your classroom. The amazing reactions in this module will glow, ooze, change color, and explode! Learn about heat, matter, and the fire triangle. Brace yourself for the flaming vortex and chemical cannon! Your students will have a hair-raising experience as we compare static electricity to high-frequency alternating current. Students will enjoy watching experiments with ultraviolet light, and bending laser beams. The program ends with a high powered musical finale. To be most effective, we must be able to work in a darkened room. Witness a liquid that is 321 degrees below zero! Experience the astonishing results that liquid nitrogen can create. This module is great companion to the combustion module. Your students will be amazed by Newton’s Laws of Motion and how they apply to everyday life. Watch a tablecloth disappear and see the world’s fastest pencil. You won’t believe your eyes as we present the screaming stick, the electric pickle, the flying French fries, and other very surprising demonstrations. Now hear this! Students will find out how vibrations make sound, see how it moves and hear a sonic boom! Students will engage in hands-on experiments exploring electricity, magnets, solar power, lasers, and more. Ask us about any special topics you might like to include during this program. Maximum Audience Size: 30 – But can be set up for ongoing demonstrations at science fairs, back to school nights or other larger groups. PLEASE NOTE: The Wizard’s Lab requires a large room with long tables, access to electricity and water, 45 minutes for setup and clean up. Have the museum bring the STARLAB to you. With a large all purpose room, you can have the stars come to you, learn about stars, day and night, and stories of old used to describe what is in the night sky. Pricing and space requirements are unique, please see below. Room requirements: A large room with a clear space of at least 25’x25’ with at least 10’ ceilings, access to an electrical outlet and 45 minutes for set up and take down. Cost: $300 for the first presentation, discount available for multiple programs on same day. (up to 3 additional presentations). A special tour of creature constellations from around the world. Hear the amazing tales people told about how those animals got placed up in the night sky. Bring a constellation to life and meet a live animal from our wildlife sanctuary! Introduces young astronomers to the night sky. Learn what causes day and night, and how to form the constellations. A deeper look into our Earth’s next door neighbor. Learn about moon phases, eclipses, the moon’s critical role in space exploration, and about the moons orbiting other planets of the solar system. Travel the Solar System to meet your planetary neighbors as you journey to exotic worlds and strange moons. The folklore from Greece, Africa, Native American tribes, and other cultures comes alive. Learn how different cultures view the constellations and the science behind them. The planetarium is appropriate for all ages from preschool through high school and beyond. These programs are held on-site at the Museum. We can accommodate class sizes of 20 to 145. 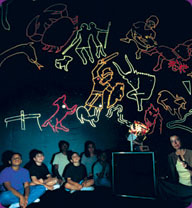 Ask us about combining planetarium shows, topic-related classes, and exhibits for an in-depth day of fun and discovery. This friendly introduction to the planetarium environment explores the shapes of things in space. We leave Earth for a close-up view of the Moon and planets. A planetarium educator concludes this program with a tour of the night sky including emphasis on the shapes of space objects. Explore the timely motions of the Sun, Moon and Planets. This class is a live tour of the night sky, with emphasis on repeating sky patterns such as the phases of the moon and constellations of the seasons, as presented by a planetarium educator. This program explores distances and the scale of the solar system. A planetarium educator continues the journey by taking students on a live tour of the universe with emphasis on celestial distances. In this live tour of the night sky, we see connections between day and night with Earth’s rotation. Seasonal changes in the path of the Sun and seasonal constellations connect with Earth’s revolution about the Sun. We examine the changing phases of the moon and view seasonal constellations and visible planets. We observe how Earth’s rotation creates our day and night, how the tilt of the Earth is responsible for the seasons, and how the orbit of the Moon produces its phases. This live program includes stories used by ancient peoples from all over the globe, such as Native American tribes and the ancient Egyptians, to explain these observations. A planetarium educator will answer questions at the end of the program. Explore issues regarding light pollution and its environmental effects on humans and animals. Engineers have designed strategies to help us preserve the night sky. Losing the Dark includes a live tour of the constellations and visible planets in the night sky with a planetarium educator. A planetarium educator compares and contrasts the Sun and Moon. We then explore the stars, moon and apparent motion of the Sun with characters from the Mister Rogers’ Neighborhood of Make Believe. This presentation combines themes of adaptations and dinosaurs through story, graphic arts and music. A planetarium educator shows students how to find a star pattern in the night sky that looks like a dinosaur. A planetarium educator compares and contrasts the surface of the Moon with other objects in our solar system. We then follow the animated story of a cat that travels to the Moon. Larry Cat learns how astronauts might adapt to working in reduced gravity and about properties of the Moon’s surface. “The class starts with an animated presentation of the classic storybook, Lars the Little Polar Bear by Hans deBeer. After exploring the biodiversity and properties of living things on the arctic and seasonal weather conditions, the program transitions to a trip to follow polar bears in their natural habitat and how that habitat has recently been affected by climate change. A planetarium educator concludes the program with suggestions on how students can help conserve our home planet Earth. A planetarium educator introduces students to any visible planets that can be seen in the current night sky. The audience then takes an imaginary trip through the solar system in a magical cardboard rocket to explore properties of solar system objects and compare conditions of other planets. The class begins with a look at today’s weather map. A planetarium educator provides an introduction to weather symbols. The program transitions to see how extreme weather can be on Earth and other places in the solar system. Program includes variation in weather, properties of solids, liquids and gases. This planetarium program is done in the style of a radio talk show. Animated DJs take the audience on a tour of the busy night sky. Topics include motions of objects in space and identifying constellations, planets and meteors. A planetarium educator concludes the program with a live “Just In” news report about a recent astronomy-related topic. Explore how an astronaut’s body responds and adapts to environmental changes in gravity. Learn how astronauts use technology and engineering to overcome the limitations of the human body and allow people to live and work in the conditions of outer space. A planetarium educator concludes the program with an update on a recent space- related mission. Covering topics in astronomy and chemistry, we begin with a live presentation of how the universe is organized by backing away from Earth in successive distances past planets, through the solar system, and out of the Milky Way Galaxy and toward a cluster of neighboring galaxies. We return to Earth and shrink down to the atomic level to see how atoms form molecules and explore the concepts of solids, liquids, gases, molecules and polymers. A planetarium educator introduces the topic of flight. We then use planetarium’s full dome technology to follow the story of a young girl and her grandfather as they explore the history of flight through advances in engineering and design. See how NASA’s research has made space travel possible. Learn how birds, kites and models fly and take an imaginary plane flight! We visit planets and moons in our solar system to learn about their atmospheres, compositions and sources of possible water. This program includes weather phenomena on other planets, motions of planets and connections between water and living things. A planetarium educator concludes the program with a brief tour of the night sky, including any visible planets. Advances in technology have allowed scientists to use special instruments to discover hundreds of planets orbiting other stars. This program explores the properties of planets and what makes a planet “Earth-like.” A planetarium educator concludes the program with a brief tour of the night sky and how to find any visible planets in our solar system. A planetarium educator introduces this program with an update on NASA’s plans to send humans to the planet Mars. We then use the immersive environment of the planetarium to travel into the future to the year 2132 to compare properties of Earth, Mars and the Moon. We see how advances in technology and future engineering possibilities may influence how humans will adapt to live and work on Earth, the Moon and Mars. In this full dome program, an astronomer invites two students to view the night sky through her telescope. As she describes the use of optical instruments and engineering advances in the telescope, we travel back in time to witness Galileo’s observations of the night sky and Newton’s discovery of the colors of the spectrum. A planetarium educator concludes the program with some of the latest views of the universe as captured by space telescopes. A planetarium educator introduces the Apollo program where astronauts first stepped foot on the Moon. Today, students and engineers around the world are competing in the Google Lunar XPRIZE to build a spacecraft, land it on the Moon and relay images back to Earth. This program follows some of the teams that are building spacecraft and their engineering designs related to advances in technology, force, mass and changes in motion. Program also includes a discussion of properties of the lunar surface and motion of the Moon about Earth. A planetarium educator introduces the topic of color with an experiment. We then begin our exploration of the electromagnetic spectrum and observe that sound and light are forms of energy and discover the reason for color. This program provides examples of why perceiving and responding to information about the environment is critical to the survival of organisms. Preschool classroom programs serve children ages 3-5 and are aligned with the Connecticut Early and Development Standards (CT ELDS). Featuring cross disciplinary connections, each program has a Literacy/Story component, a Language component with new vocabulary and conversations, and the Science and Social Studies connections listed below. Learn the differences between a mammal, a reptile, an amphibian and an insect. They may be furry, but what else makes an animal a mammal? Hop to it! Learn all about the metamorphosis from tadpoles to frogs. Leaping lizards! Don’t be afraid when you come face to face with living dragons and learn more about reptiles. Have a visit from one of the most unique and longest living creatures on earth. They’ve been around since dinosaur times! Some are creepy, others are crawly, but all are fascinating as we learn about these 6 legged friends. This class features hands-on science experiments. Explore and experiment with color using a variety of materials. Mix, match and make discoveries. Planetarium, or done independently. Learning strands: Making observations and predictions, investigating cause and effect, change over time, and the use of technology to help us understand the world around us, using evidence to make connections. 1. Moon’s Mysteries- Learn all about the moon, why it seems to change and what we know about this mysterious thing we see in the sky. 2. Sun and Shadows- Learn all about the sun. Experiment with light and how it creates shadows around us.